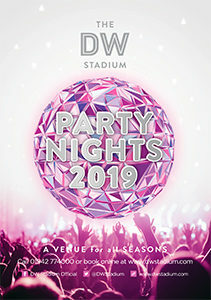 Come and party with us at the DW Stadium in 2019. With prices starting from just £23.50 per person, we are sure to have a party night to suit your taste and budget. If you would like to discuss your requirements now, please call the Sales Team on 01942 770455 or click on the image below to find out more about our 2019 line up.